Scuba Diving Wetsuits – A diving wetsuit is what we wear when we go into the water and they can be used for water skiing, kayaking, surfing and all manner of water sports as well as while scuba diving- a wetsuit is thermal protection. Scuba diving wetsuits are made from neoprene, and neoprene is rubber, rubber made with millions of tiny little bubbles in it the neoprene. The rubber is then usually covered in a fashionable material to look good. The scuba diver’s wetsuit once submersed in water, traps the cold water between the layer of human skin and the neoprene, allowing for very little movement of the water -it is important for wetsuits to fit properly and not be loose. A lose fitting wetsuit does not work at all. The water needs to be trapped by the body, once the water is held in place, the body works to warm up the water and it is the warm water trapped which helps reduces cooling of the body too rapidly whilst diving. It is possible to buy titanium lined scuba diving wetsuits, the titanium is added in between the interior lining and the neoprene, or it can be woven into the threading of the suit. The titanium is said to reflect about a 5th of the heat lost back onto the diver’s body. These suits are more expensive, but definitely worth considering especially if you are diving in really cold places. Something we not need here in Thailand as the water temperatures are in a pleasant range. 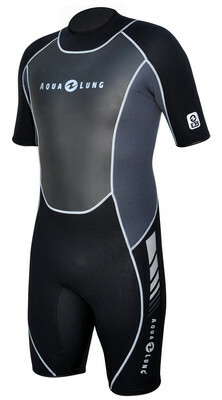 Other than the pretty patterns of a wetsuit, the most singular important factor is the thickness. The thicker the wetsuit the warmer it is, however the thicker the wetsuit the more restrictive your movements are underwater. Depending where in the world you are diving and under what conditions will and should determine the wetsuits thickness. Diving in waters over 26 degrees, you really need nothing more than a 3 mm shorty; in fact, where we dive in Thailand, many diving instructors where only board shorts and a simple rash vest for protection. Scuba Wetsuits are also available in full length styles, with varying degrees of thickness, it would not be correct of me to tell you which suit to buy for the local waters you dive in. I suggest going down to the local dive equipment specialist and seeing what they recommend. Scuba Wetsuits vary in size and you can buy scuba diving wetsuits with different thickness of neoprene on different parts of the suit. For example, you may buy one that has 3 mm arms and legs and a 5 mm core to it, and so on, there are many permutations. When trying on a scuba wetsuit to check it fits properly is paramount. Scuba Wetsuits are notoriously tricky to get on and off quickly and the thicker the suit the harder it is. Check the wetsuit is not pulling on any areas of the body. Make sure the crutch is not too tight or loose. If the wetsuit is even a little too small, it will pull continuously on the stitching and eventually it will fall apart. As with all scuba gear, whether used in fresh or salt water it is important to clean all your gear thoroughly, wetsuits are no different. Whenever possible soak your wetsuit in fresh water for a god few minutes or so, this can help rid the wetsuit of any nasty elements, including any odors it may have picked up. You can buy wetsuit cleaning detergents from any decent scuba diving equipment shop. These are recommended, you can even use baby shampoo, as it has no harsh chemicals in it. It is a good idea to wash your wetsuit from time to time when not diving due to inactivity. Finally hang your wetsuit to dry on a strong hanger, you can also purchase special hangers form any dive gear outlet specialist. Best not to use any hangers made from metal, they may stain the inner material with rust. Once dried, store in a cool dry place ready for the next time to you go scuba diving.